The Lazer 917 was a reasonably popular kit car back in the ‘70s and ‘80s that would let you take that old Beetle your neighbor’s kid rolled and turn it into something that looked like a Porsche 917 built by the Pep Boys while on ketamine. And this one currently for sale on Craigslist may be the best one ever. Sure, for many people, the phrase “best Lazer 917 ever” has about as much impact as “best partially-urinated on Arby’s Hot Ham and Cheese ever.” It’s a pretty low bar. But I appreciate the Lazer 917 — if any car (or even kit car) doesn’t take itself too seriously and understands the elusive concept of “fun” the Lazer 917 is it. This particular one takes all the over-the-top ridiculousness of the 917 and then gets it drunk and crazy. Flame thrower - We developed a propane-based flame thrower that sticks up from the roof at about 45 degrees. While less spectacular than having flames come out the exhaust pipes, it’s also much less dangerous. Taser hood ornament - We spotted a guy selling “stun guns” at a Tucson swap meet. Impressed by the 2” spark and the ripping sound it made, we bought one and made a hood ornament out of it. Rear view TV camera - Since the back windshield is small, the TV camera lets us keep on eye what’s creeping up behind. Fender skirts on all the wheels - Since using stock VW wheels and tires puts them considerably inside the fenders, we can turn the front wheels lock to lock without hitting our front skirts. A great look! Hovercraft look - In addition to the skirts, we hung a fringe of outdoor carpeting totally around the car making it look a bit like a hovercraft. We protect the carpet where it might scrape the road with foam, tubular pipe insulation that can be easily replaced when it becomes too frayed. It’s street legal. We often drive it around it with the doors propped open, sort of a “bird of prey look.” Lots of people pass us with their cell phones out the window taking our pictures. Is there any car that passes your personal checklist of flame thrower, hood-mounted taser, and ‘hovercraft look’ as well? I doubt it. Air conditioning - Since we live in Arizona, we decided that some sort of AC was necessary. Noticing that there was lots of room under the rear fenders, we mounted a 120V, 2500W, electric generator, connected to the car’s gas tank. That’s connected to a 1 ton standard house AC unit, mounted behind the seats. There’s also a standard 120V electric wall receptacle, inside to cab for hooking up tools, etc. A whole separate 120V AC generator and a house A/C unit. Perfect. It’s worth watching the video they made of the car in action. Pay very special attention to the driving position, which is basically lying on your back while steering with a bagel-sized steering wheel propped on your lower abdomen. They’re asking $5500. 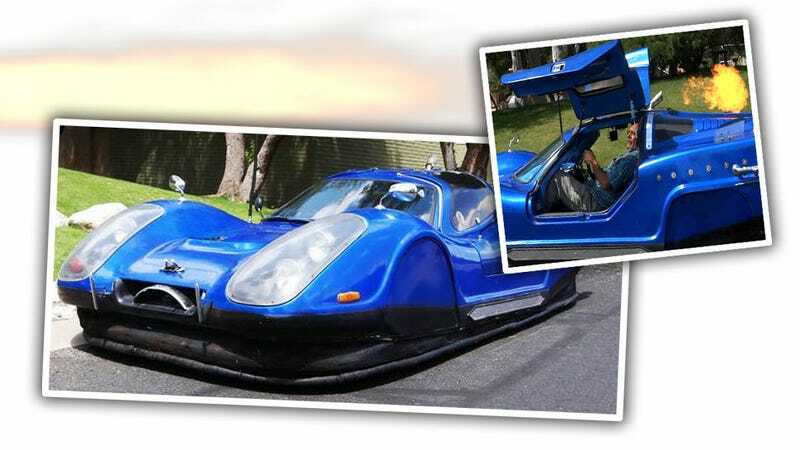 For a street-legal, cheap and easy to run and fix hypercar (don’t check) that can tase creeps and shoot flames and let you plug in your belt sander and freeze you into an ice cube as you lay back and try to drive this blue streak of insanity that also sort of resembles a hovercraft.